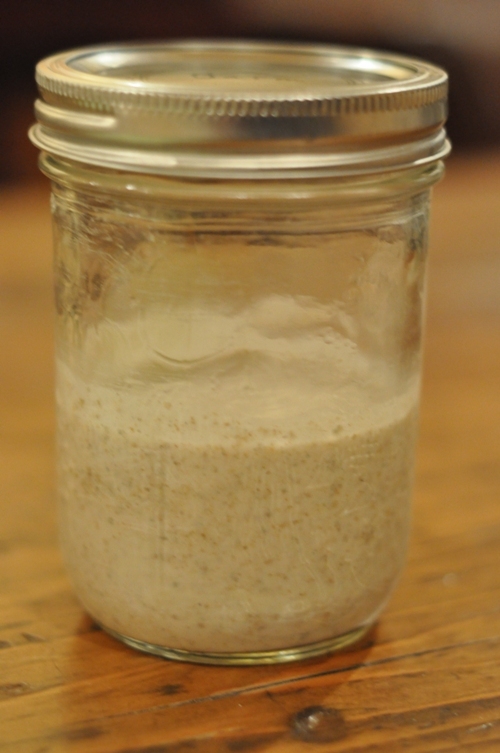 For naturally leavened bread this sourdough starter will replace commercial yeast in your bread recipes. It can be difficult to get going and we failed the first three times but patience and persistence along with a stubborn nature eventually granted us success. And, it is more than definitely worth it. Tartine Bread by Chad Robertson is an instrumental guide for those interested in naturally leavened breads. As well, The Fresh Loaf provides a wealth of information for the home baker. Mix well to combine 2 pounds white flour with 2 pounds whole wheat flour. Half fill a small clear glass bowl with lukewarm water. Add a handful of flour mixture to the water to achieve the consistency of thick batter, free of lumps. Cover the dough with a towel and place in a cool spot (out of direct sunlight) for 2 to 3 days. After 2 to 3 days, check the culture to see if any bubbles have formed around the sides and on the surface. If the culture seems inactive, let it sit for another day or two. In this initial stage when the culture smells strong and tastes acidic it is ripe and ready for the first feeding. To feed the culture discard about 80% and replace the discarded portion with equal amounts of water and the flour blend. Mix to combine. Repeat this process every 24 hours at roughly the same time every day. After a few days of repeating this process successfully you will have a consistent starter that once fed will remain active for three days unrefrigerated. OR, keep in the refrigerator for weeks in between feeding.